The Biggest Story was seriously one of the most brilliantly beautiful books I’ve ever seen! It is stunning! It is filled with bright colors, beautiful pictures, sturdy pages. Not too many words on each page, so it will hold the attention of even the smallest listener. Definitely going to be a great addition to our growing collection of awesome books. This is a beautifully written story bible. It is broken up into 10 chapters from Adam and Eve to the story of Jesus. The Author takes you on an exciting journey from the garden to the cross and resurrection in a new and exciting way. It is filled with really interesting pictures all throughout. This is a page turner for sure. I read it to my kids everyday and everyday they would sigh when I said reading time was up, “But Mom, just a few more pages please?” They loved it and I so did I. It is a perfect blend of the overall goal of God’s plan for our redemption from old testament to new. Each part of this story is short, sweet and to the point. Easily getting the gist of it all for my kids. My older girls love that they know the story and love hearing it in a new way. My youngest daughter is having fun learning what happened in a not-so-overwhelming way. Oh and the illustrations are amazing. They have pages with gorgeous pictures and no words at all. Yes of course in a book like this there are a lot of things missing, but the point of this type of book (bible story) is to retell a story in a way that children will understand it and accept it. It is not meant to be word for word what the bible says. They obviously need complete scripture reading besides this, but I think it is a great tool to pull out the key points and help kids understand the big picture of Jesus the snake crusher! If you are like me you start your little ones out with bible stories and easy scriptures anyway. This just ties it all into one big story which is the ultimate story and point of the bible and why Jesus was born, crucified and resurrected. The ultimate sacrifice- The Biggest Story – (Jesus) How the snake crusher brings us back to the garden! The Bible is loaded with a lot of exciting stories. But kids need to know how all those classic stories connect to Scripture’s overarching message about God’s glorious plan to redeem his rebellious people. In The Biggest Story: How the Snake Crusher Brings Us Back to the Garden, Kevin DeYoung—a best-selling author and father of six—leads kids and parents alike on an exciting journey through the Bible, connecting the dots from the garden of Eden to Christ’s death on the cross to the new heaven and new earth. Learn more about the book, download a free excerpt, and read our interview with the illustrator. In The Biggest Story, Kevin DeYoung – a best-selling author and father of six – leads kids and parents alike on an exciting journey through the Bible, connecting the dots from the garden of Eden to Christ’s death on the cross to the new heave and new earth. 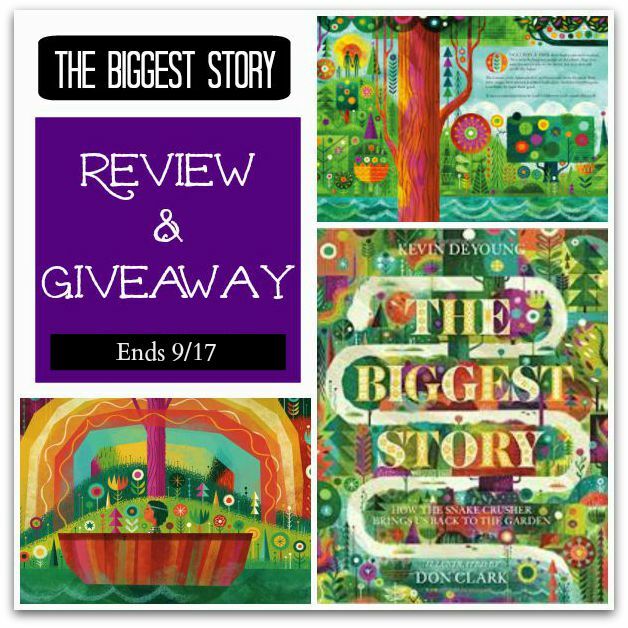 With powerful illustrations by award-winning artist Don Clark, this imaginative retelling of the Bible’s core message-how the Snake Crusher brings us back to the garden-will draw children into the biblical story, teaching them that God’s promises are even bigger and better than we think. Enter to win a copy of this BEAUTIFUL book. This giveaway is open to US and Canada Residents only. Ends 9/17/15 @ 11:59 pm. I would like to win this for a child at work. The main reason I want this book is for my son who just entered 1st grade and we must read together every night. He would absolutely LOVE this book!! I would like to share this book in our homeschool lessons. My son reads bible stories to my grandchildren every night, he would make good use of this book. What a wonderful book to share with my family. I like this a lot. It looks like it would keep my daughter’s attention. Some Bible books do not do that, but these graphics would! Thanks for the possibility of having it free! I would like to win this to give to my sweet niece! I’ve seen lots of great reviews for this book and would like to have it. I want to win this book because I have a lot of children in my life to share this beautiful story with, thank you! Looks like a beautiful story Bible that helps connect the dots for children (from creation to fall to promise of redemption). We just spotted this beautiful book at Barnes & Noble and would love to own a copy!